Zero 2 Infinity is an aerospace company specialised in Near Space transportation. It is working on an innovative solution to launch small satellites to low Earth orbit (LEO). The company has its headquarters in Barcelona and has also subsidiaries in Germany and the US. Barcelona, May 24th 2018.- The European Space transportation company Zero 2 Infinity (Z2I) has opened a new investment round of £1 million through Crowdcube to fund the company’s growth plan and its vision to make Space more accessible for all. The Crowdcube campaign is open to everyone who signs up to the platform, with the minimum investment set at £25. Since inception, Z2I has received over €5 million across a number of investment rounds. This campaign is set to fund the next technical milestone in the development of Bloostar. Bloostar is the name of the company’s dedicated satellite launcher. 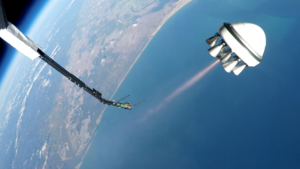 Bloostar’s first stage is a high altitude balloon that takes the launcher to 25 km (>80,000 feet), where it ignites its engines and accelerates to provide for satellite orbit insertion. It is a simplified way of accessing orbit. With the balloon, altitude is gained, and with the rocket, speed. Furthermore, Bloostar is less expensive than any other solution and environmentally friendly. Bloostar has been shortlisted by the European Space Agency (ESA) in its recent micro-launcher study, the Launchers Preparatory Programme (LPP). ESA chose feasibility studies from industry proposing an economically viable, commercially self-sustaining innovative micro-launcher. The Space industry is said to reach $2.7 trillion in three decades, up from c. $350 billion today, and the launch segment is ripe for change. For now, there is no European dedicated ride to Space for small satellites, and Z2I aims to fill the gap. Since it was founded in 2009, the company has performed more than 40 flights to Near Space and has become the only private actor in Europe working on elevating payloads to Near Space for component testing and for science. The campaign can be checked here.